We often receive suggestions for campervan accessories, but this is the first one we’ve had specifically for kids. We received a copy of a children’s story and colouring book for little campers and decided to get some expert help to review it. 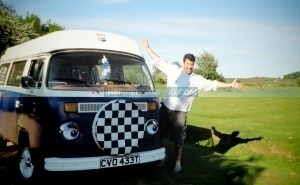 The Little Blue Campervan has a sweet little storyline and loveable characters. The books are very high quality and have great pictures throughout with bright colours and friendly faces. The story book is covered in lovely artwork and vibrant colours, giving plenty to keep the kids entertained as they either read or are read the story. The Little Blue Campervan is about a sad and lonely van who dreams of having adventures, meeting new people and discovering new places. The story develops when he unexpectedly becomes a hero and meets his new family for the first time. The colouring book is full of large images from The Little Blue Campervan story. They are printed on thick, good quality paper which makes them a pleasure to colour. One comment from our little helpers was that there were lots of pictures for boys and not that many for girls, but that didn’t stop them from scattering the colouring pencils all over the table as they got involved in the process of giving life to the black and white pictures. The added benefit to both books is the website where they can be bought from, which offers other activities for children in a Kids Zone, and for parents who can also hire out the Little Blue Campervan. For the authors of the book it all started in June 2009 when they made the decision to buy their blue ’79’ bay Devon Moonraker at Bristol Volksfest. Not knowing a thing about engines, body work they entered the VW scene full of great excitement and enthusiasm for hitting the open road, full of grand ideas about future holiday plans and all the places they would now be able to visit. They’ve had inevitable ups and downs with their real life story of owning a VW campervan, but continue to travel around the country, going to schools and VW events encouraging kids to get off the sofa, put away their game consoles and explore their outdoor environment. Books sales and being able to hire out the Little Blue Campervan will help to fund further books in the series and the Inspired Camping little helpers can’t wait for that. If your little campers love campervans then this is the book for them as it would make a perfect stocking filler this Christmas. The added bonus of more stories in the series being promised, online games and activities and even being able to hire out the Little Blue make this story very attractive to little campers. The book can be bought through their online store. This is a high quality printed story and colouring book that would make an ideal Christmas present or stocking filler for little campers who love VW campervans… 4 stars.